You can travel between Schiphol Airport and Amsterdam (16km or 9 miles) by train, bus or private taxi. As long as you don’t have too much luggage, the easiest way to Amsterdam and destinations across the Netherlands is by train. Direct trains run 24 hours a day. There are at least 4 an hour, except in the middle of the night, when there’s only one an hour. The journey from Schiphol to Amsterdam Central Station (Amsterdam Centraal) takes about 15 minutes. TIP: You can buy your ticket while you’re waiting for your luggage! Look for the blue and yellow ticket machines next to the baggage belts. It’s also possible to buy tickets near the platforms. Once you’ve cleared customs and picked up your luggage, just follow the signs to the train station. It’s in the airport, and most trains to Amsterdam leave from platform 1-2. A one-way ticket costs €3.70. 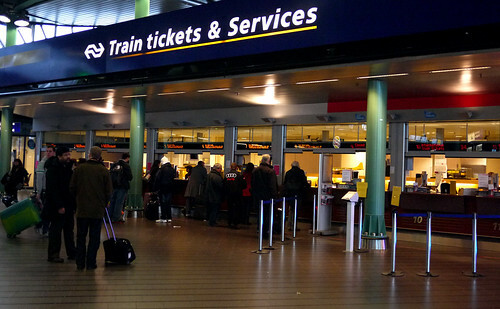 To get back to Schiphol, trains generally leave from platforms 13, 14 and 15. This is one of the typical blue and yellow trains that normally take passengers to and from Schiphol Airport. 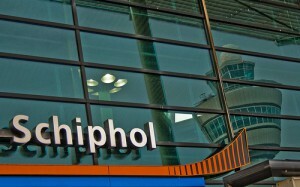 It’s also easy to travel between Schiphol Airport and destinations other than Amsterdam. If you want to ease into your vacation in a more tranquil setting, consider going to The Hague or Utrecht first (4 departures an hour, 30-40 minutes travel time). Museum-rich Haarlem is also a good choice (7-8 departures an hour, 30 minutes travel time, change in Amsterdam Sloterdijk). Bus 197 will take you to the heart of Amsterdam. A ticket costs €4 and you can buy it in the bus. TIP: Groups of 2 adults and up to 3 kids can ask for the Buzzer ticket. It costs €13 and lets you travel the whole day on all buses run by Connexxion. The main advantage of the bus is that it stops at Leidseplein, Museumplein and Marnixstraat where many hotels are located. If you’re staying around these areas, taking the bus will save you the hassle of changing from the train to a bus or tram at Amsterdam Central train station. On the downside, the normally 30 minute trip could take longer than you expect if traffic is bad! It costs €40-50 to reach Amsterdam city centre from Schiphol airport. Taxis go from outside the main plaza, and you can pick any one you want (you don’t have to take the first in line). For groups of 3-4 people, the price becomes more reasonable, and a taxi is certainly more convenient if you have a lot of luggage. To save 25-30% off the standard rate, book your taxi ahead of time. This is easy to do online. Just Google for ‘taxi’ and ‘Schiphol’. You’ll find dozens of companies offering this service. Once booked, your driver will meet you at an information point or the arrival gates. You do not have to pay a supplement anymore for the Fyra between Schiphol and Amsterdam Centraal. And the name has also changed in mid december to “Intercity direct” in a feeble attempt to make you forget the Dutch-Belgian highspeed train desaster. Good to know, Rene. I’ll update this!